The main splash page of the site. A summary of the back-end workflow. 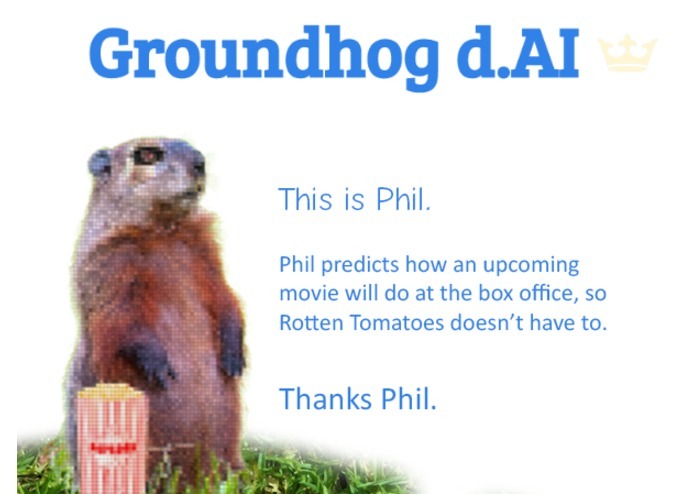 Groundhog d.AI is an Azure-cloud-powered, mobile-un-ready, online only, ReactJS powered movie artificial intelligence. Predict whether future movies will be box office successes. Test our ground(h0g) breaking model on past movies to see how well we perform. 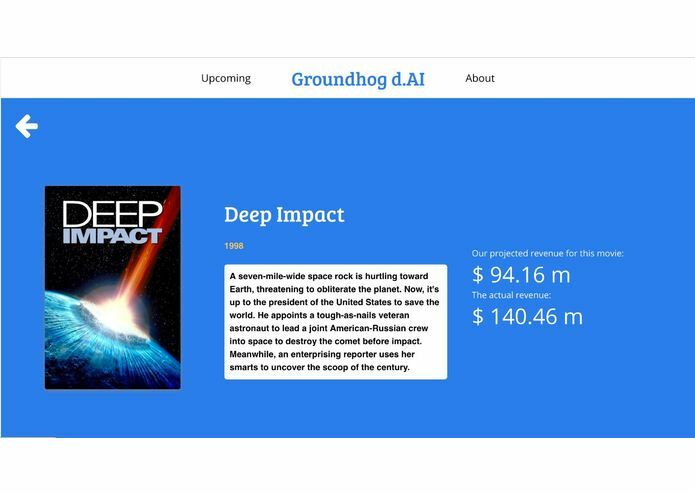 The front end of Groundhog d.Ai was build using React.js. As the state of the application was not overly complicated, we elected to not use a state management system like Flux or Redux. We used Webpack to bundle both the Express server files and the React client files for the overarching client service. 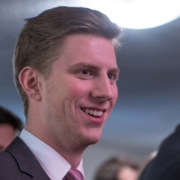 Both the client service and the API service were deployed on individual Kubernetes clusters, hosted on Google's Cloud Platform, which each had their own NGINX load balancer. These two services each have 3 pods running the service. 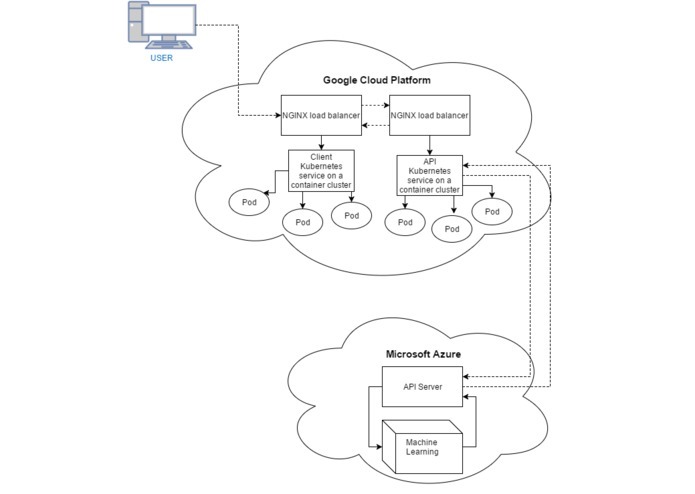 Microsoft's Azure Cloud is being used for hosting the Machine Learning algorithms used to predict the success of upcoming movies. To make sure that our application is future-proofed, ES2015 (ES6) code was used throughout with Babel being used to transpile back to ES5 code. 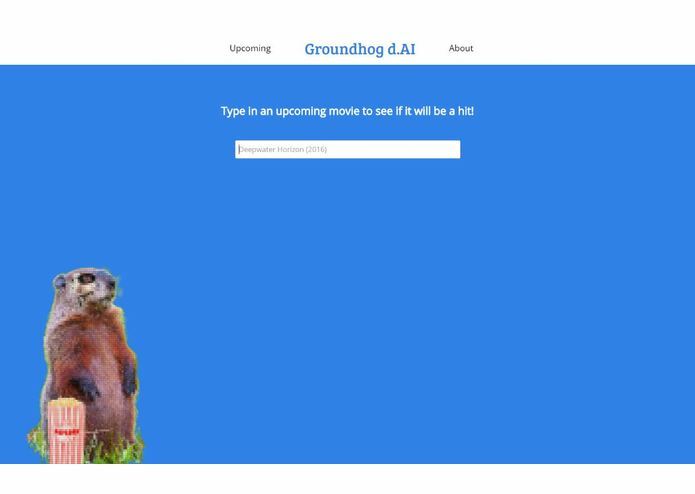 Get trapped in a time warp similar to one William Murray in a film named "Groundhog Day"
I did front-end stuff and made pictures of groundhogs. I configured the Jenkins workflow for the project as well as headed up our DevOps, mainly focusing on server deployment and containerization using Docker and managed by Kubernetes. 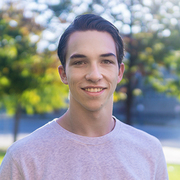 I worked on data acquisition, machine learning, built the API which interfaced with TheMovieDB API, assisted Zack in setting up kubernetes and continuous integrations and helped the front-end team as needed. I worked on the front-end and did a lot of interfacing with the end points of our API and TheMovieDB API. Got to practice and learn some new things about React and CSS.